The Japanese imperial family has formally set 15 November as the date for Princess Sayako's marriage to government worker Yoshiki Kuroda. The date was revealed on Wednesday as part of a series of rituals in the run-up to the wedding. The prospective groom's cousin gave the planned date to the Imperial Agency's grand steward, who passed it to the emperor and empress for acceptance. Princess Sayako is the first emperor's daughter to marry in 45 years. Wednesday's ceremony was part of a ritual called Kokki no Gi, or "the rite of announcing the date". Other traditional rites before the wedding include the princess reporting her marriage to the past emperors enshrined in the palace, and meeting the emperor and the empress to show her gratitude on 12 November. 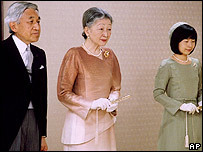 The princess is the only daughter and youngest child of Emperor Akihito and Empress Michiko. She will have to leave the Japanese royal family after her marriage, as her fiancé is a commoner.